Puma Exploration is a Canadian mineral exploration company with advanced precious and base metals projects in Canada. 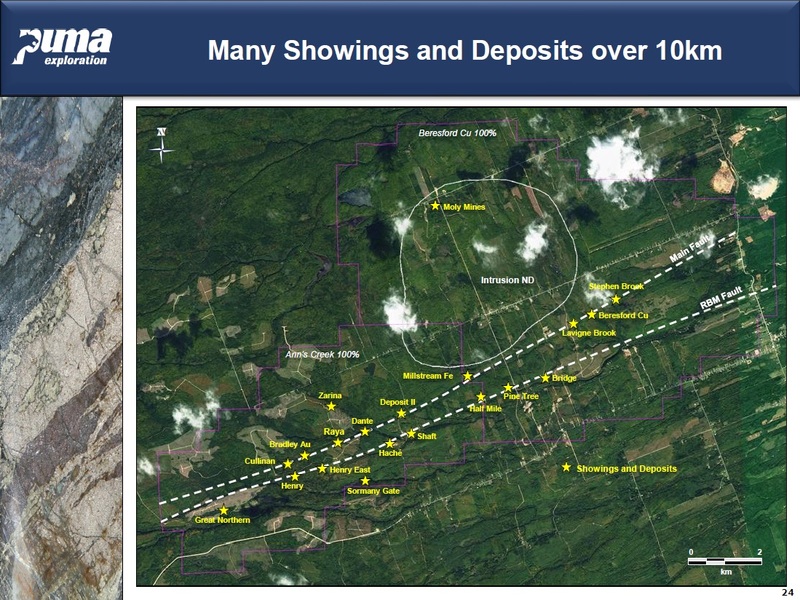 The Company's major assets consist of an option to acquire 100% beneficial interest in the Murray Brook Property on which it has signed a Strategic Alliance Agreement with Trevali Mining Corp. (TV-TSX), the Turgeon Zinc-Copper Project and the Nicholas-Denys Project, all located in New Brunswick. The Company also holds an equity interest in BWR Resources, Manitoba. Puma’s objective is to focus its exploration efforts in New Brunswick. The Murray Brook Project consists of three (3) distinct contiguous areas that cover more than 18 kilometers of the favorable rocks that host the operating Caribou Mine (Trevali Mining Corp.), the Murray Brook Deposit and the past operating Restigouche Mine (Trevali Mining Corp.). From east to west, the project comprises the Murray Brook East Property, the Murray Brook Mining Lease and the Murray Brook West Property. The Murray Brook East and Murray Brook West Properties have been subject to various degrees of exploration and share the same potential of increasing the mineral resources defined at the Murray Brook Deposit. The Company has defined several future priority targets on these properties. These targets will be the focus of an aggressive drill program which will start in May. The Murray Brook deposit has a currently defined (Dec. 2016) NI 43-101 Measured and Indicated mineral resources of 5.28 million tonnes averaging 5.24% zinc, 1.80% lead, 0.46% copper, 68.9 g/t silver and 0.65 g/t gold, containing 610 Mlbs of Zinc, 209 Mlbs of Lead, 54 Mlbs of copper, 11.7 Moz of silver and 111 Koz of gold. The core of the mineral resource occurs in the West Zone which is 200 meters wide, extending from surface to 300 meters vertical and the true thickness of the massive sulphide body varies from 75 meters to 100 meters. The East Zone (Copper-Gold) is 100 meters wide, also extending from surface to 300 vertical meters and is mainly mineralized with gold and copper. On April 30th 2018, Puma Exploration and Trevali Mining Corporation (TV-TSX) signed a Definitive Strategic Alliance agreement for the development of the Murray Brook Deposit (ML 252) and the exploration of combined mining properties in the Restigouche–Armstrong Belt region of New Brunswick. 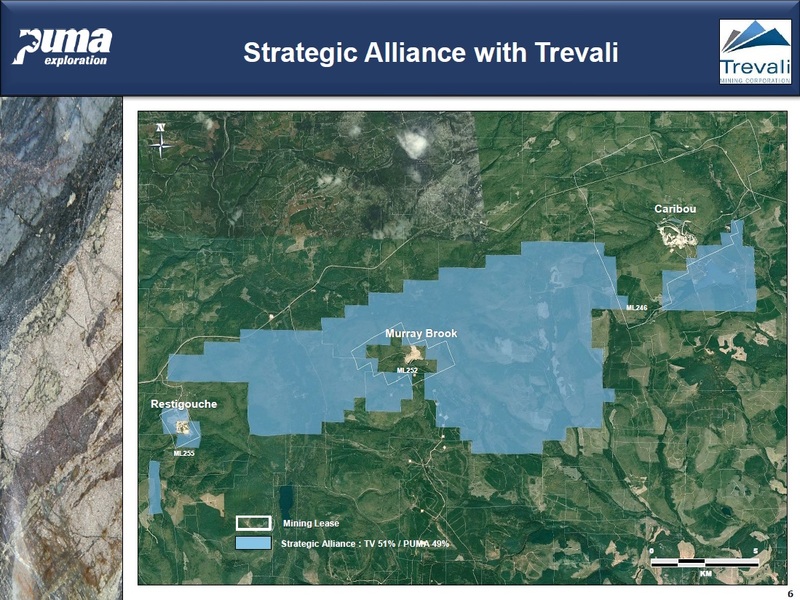 Trevali will provide up to CAD$7.5 million dollars funding required to finalize the acquisition of 100% of the Murray Brook Deposit and the Murray Brook East Property. Ownership in the Murray Brook Deposit (ML 252) will be 75% TV and 25% PUMA. Trevali brings to the agreement its extensive expertise in advanced stage project management, with a proven track record of efficiently moving assets from exploration, through permitting and development, to production. Trevali will provide metallurgical and geochemical consulting expertise. Trevali will also provide access to the Caribou concentrator and Mine infrastructure. Trevali's experience with Mi'kmaq partners will facilitate the negotiation of a new agreement with said partners. Trevali's expertise and infrastructure will considerably reduce the costs of bringing to production the Murray Brook Deposit. Ownership in all other exploration properties held by both TV and PUMA in Restigouche -Armstrong Belt included in the Strategic Alliance (8,503Ha) will be 51% TV and 49% PUMA with Puma as manager of the exploration programs. The Exploration Alliance area of interest covers more than 32,000 hectares. Puma gains access to four (4) new properties (1,286 ha.) all 100% previously held by Trevali. Puma maintains 100% interest in all its other held properties in the Bathurst Mining Camp, namely; Turgeon, Nicholas-Denys, Beresford Copper, Ann's Creek and Legacy (11,185 ha.). 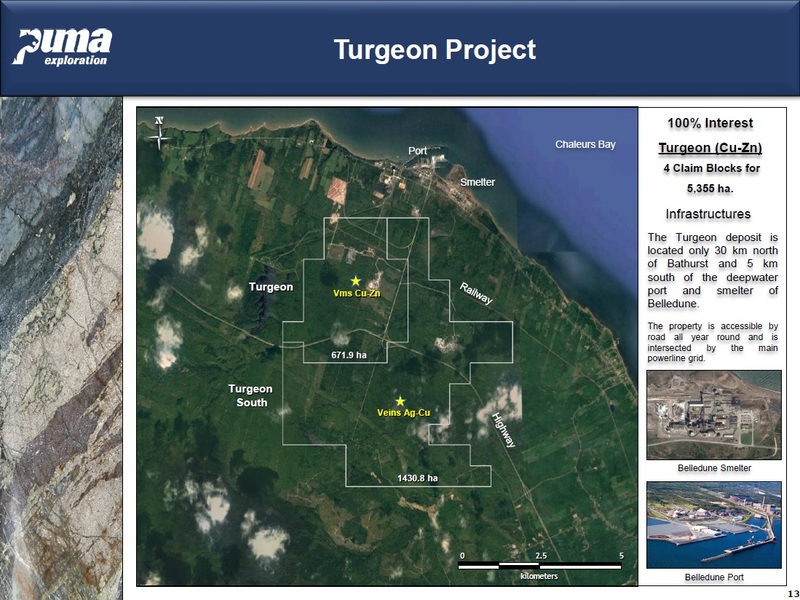 The Turgeon deposit is located only 30 km north of Bathurst and 5 km south of the deepwater port and smelter of Belledune. 2008, NI 43-101 report 1million oz silver, since the report 84 more holes have been drilled. Mr. Robillard was a project geologist and project manager for Géominex. Since 2007, Mr. Robillard is the president of Puma Exploration in addition to being direction manager of this company since 2010. He is also a director of Komet Resources Inc.
Mr. Gagné has 12 years of experience in the field of mining exploration. Between 2007 and 2013, he acted as project geologist for Géominex. Mr. Gagné is a member of the Order of Geologists of Québec and of the Association of Professional Engineers and Geoscientists of New Brunswick. Mr. Cordick is involved in brokerage and finance industries for over 25 years. Mr. Thibault worked as a mining engineer with over 32 years of experience. He is currently president, direction manager and director of Antioquia Gold Inc.
Ms. Slivitzky was president of Maudore Minerals Ltd. She has continued to act as a director of this company and other public corporations. On April 01, 2019, Puma Exploration and El Nino Ventures amended the terms of the Murray Brook property agreement. By mutual agreement, Puma Exploration Inc. and El Nino Ventures have agreed to modify the terms of the amended and restated asset purchase agreement signed Oct. 5, 2016, as amended thereafter. Pursuant to the third amending agreement signed by Puma and El Nino, Puma now has until June 30, 2019, to proceed with the final $1-million cash consideration. In addition, subject to the obtention of the approval of the TSX Venture Exchange, Puma shall pay El Nino one million shares of its capital stock as an additional fee. 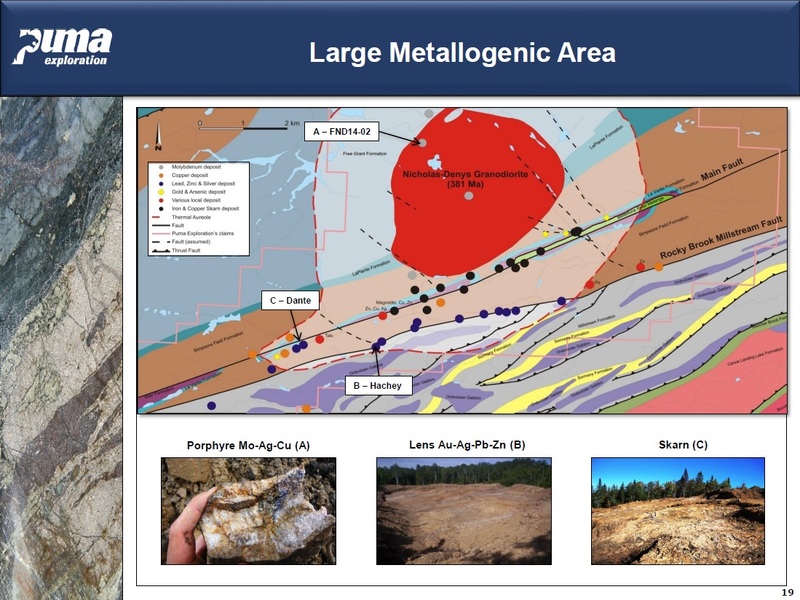 On March 28, 2019, Puma Exploration Inc. has released positive results for the metallurgical program currently in progress at Murray Brook deposit, located in the famous Bathurst mining camp (BMC) in New Brunswick. The zinc-lead zone (P1) of the deposit yields recoveries of 86.6 per cent zinc and 70.4 per cent lead with 39.9 per cent of silver reporting to the lead concentrate. The P1 results are higher than the published results by Trevali from the Caribou underground mine and also significantly higher than the initial recovery tests conducted by Votorantim Metals Canada in the studies of 2013. On March 25, 2019, Puma Exploration Inc. and Votorantim Metals Canada Inc., by mutual agreement, have agreed to modify the terms of the amended and restated asset purchase agreement signed on Oct. 5, 2016, as amended thereafter. Pursuant to the third amending agreement signed by Puma and Votorantim, Puma now has until June 30, 2019, to proceed with the final $3-million cash consideration. On March 18, 2019, Puma Exploration Inc. has mutually agreed with Trevali Mining Corp. to terminate, effective as of March 15, 2019, the option agreement for the Murray Brook property dated April 27, 2018, as amended Nov. 30, 2018. On August 29, 2018, Puma Exploration Inc. and Trevali Mining Corp. have released the drill results for the metallurgical drilling program conducted at the Murray Brook deposit located in New Brunswick, Canada. A seven-hole, 1,700-metre geotechnical and metallurgical drill program was undertaken. The program successfully intersected the massive sulphide deposit in each hole, matching perfectly with the resources model and a potential internal mine design. MB18-07 intersected 87.1 metres averaging 6.9 per cent Zn and 2.4 per cent Pb (including a 21-metre interval of 10.2 per cent Zn and 3.1 per cent Pb). On June 14, 2018, Puma Exploration Inc. and Trevali Mining Corp. have held their first technical committee meeting, as contemplated in the option agreement signed and announced on April 30, 2018, whereby a budget of $1-million has been approved for the development and exploration work program on the Murray Brook deposit. 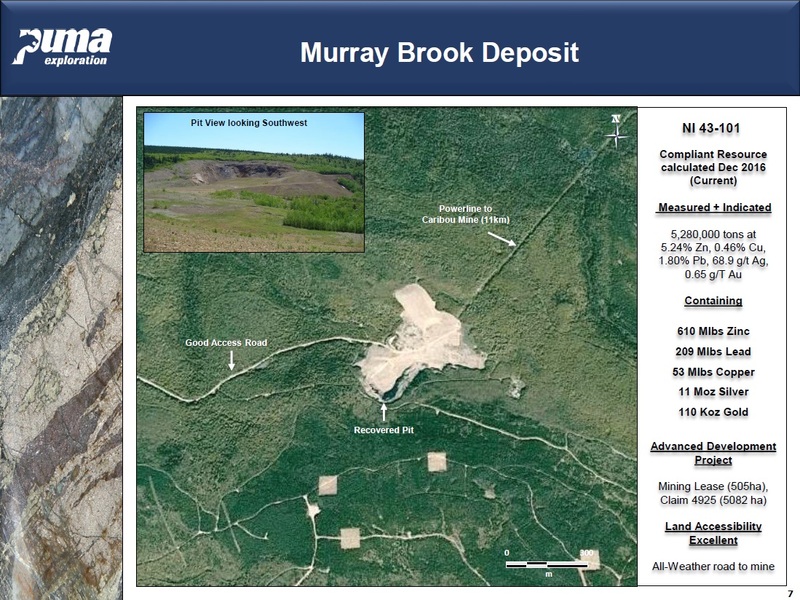 The program's goal is to move the Murray Brook deposit to a production decision in a timely manner. Trevali will manage the advanced engineering studies and the technical aspects of the program, and Puma will be responsible for the field exploration and geological interpretation. The budgeted amount of $1-million is to be financed proportionally 75 per cent by Trevali and 25 per cent by Puma. Drilling programs consisting of about 5,000 metres are fully permitted and are under way. Trenching programs will be conducted on the eastern side of the deposit to locate the favourable Caribou horizon and generate new drilling targets. Initial engineering work to define the future production pathway options. Co-ordination with various government departments and agencies on the environmental protocols and bonding, and future permitting. On June 13, 2018, Puma Exploration Inc. has provided update on various corporate matters. 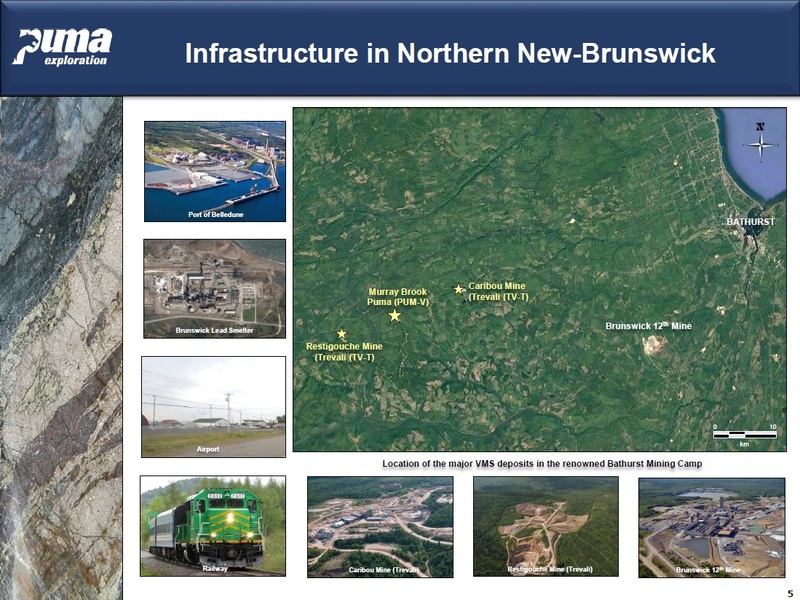 Over the past two years, the Company has focused its efforts on the acquisition, the development and the exploration of the Murray Brook project in New Brunswick, with the goal of seeing the Murray Brook deposit go into production. The Company also announced the resignation, effective on June 12, 2018, of Isabelle Valiquette from the board of directors of Puma Exploration and appointed Ms. Valiquette as special advisory to the board. On June 12, 2018, the board of directors of Puma Exploration granted 5.4 million stock options with an exercise price of 10 cents, expiring on June 12, 2023. Puma proposed to extend the expiry dates of 9,099,665 outstanding share purchase warrants that were issued pursuant to a private placement completed July 19, 2016, from July 19, 2018 to Dec. 31, 2018. On April 30, 2018, Puma Exploration Inc. announced that it has signed a definitive option agreement with Trevali Mining Corp. (TV-TSX), setting the terms of the development and the exploration of the Murray Brook deposit, and has signed a strategic alliance agreement setting the terms of the exploration of combined mining properties in the Restigouche-Armstrong belt region of New Brunswick. Under the terms of the option agreement, Trevali will provide up to $7.5-million of financing to finalize the acquisition of the Murray Brook project.